This is a special card for a number of reasons, but one is that it’s a great full shot of the Houston uniform of the era. This picture, from 1963, shows Umbricht wearing the road uniform (even though it looks white in the photo). The Colt .45s became the Astros in 1965. This card is in great shape, but it’s nearly a complete miscut. Probably could be an EX-MT if not for the major flaw. 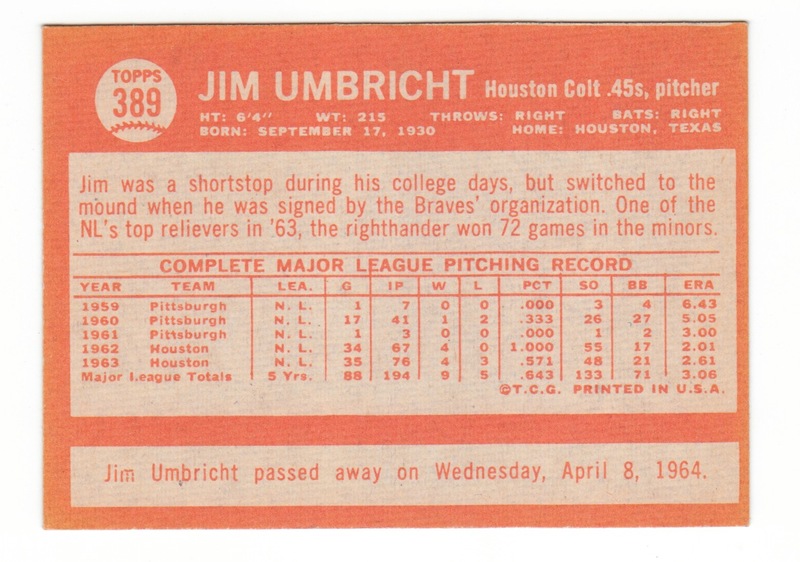 As you can see from the back of this card, Jim Umbricht died just five days before the beginning of the 1964 season, making this his final card. He had a tumor removed before the 1963 season, after which he had his second straight impressive season out of the Houston bullpen. But his cancer eventually returned, and he succumbed to melanoma at age 33. Unlike Ken Hubbs, Umbricht did not get a special memorial card from Topps. Instead, they just issued his regular card with a note on the reverse. Hubbs likely earned a more formal memorial because of his youth, rising star status, circumstances of his death (a plane crash), and perhaps most importantly the fact that his death came in February, giving Topps enough time to put together a card. Umbricht, however, was well-known at the time for his battle with cancer, and the Colts retired his number shortly after his death. The team’s MVP award is still named in his honor. He was a late bloomer, not reaching the majors until the age of 28. As the back of his card notes, he was an infielder who was converted to a pitcher in his the mid-1950s. After 19 unremarkable pitching appearances over three seasons with the Pirates, Houston picked Umbricht in the 1961 expansion draft. Over two seasons with the Colts, during which he pitched 143 innings, he posted a 2.33 ERA (148 ERA+) and 0.986 WHIP. This despite dealing with his cancer for much of that span. 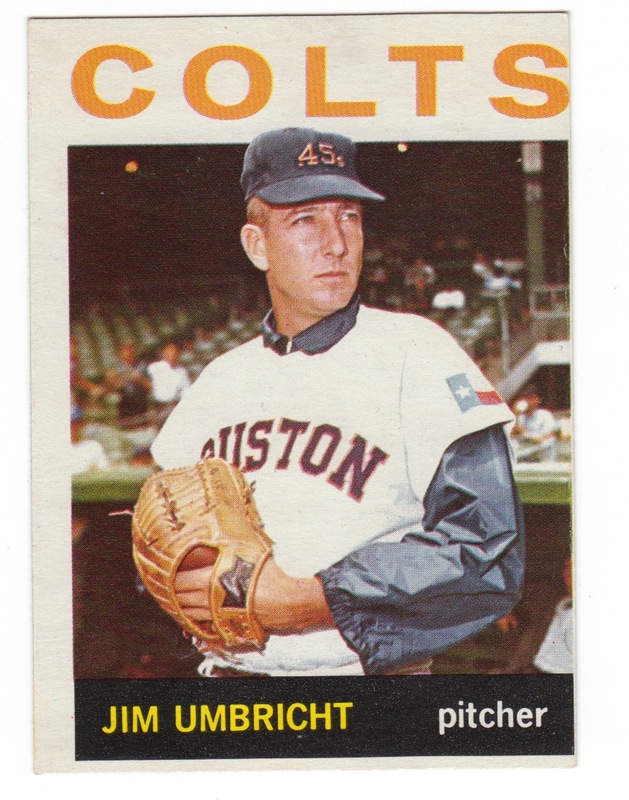 The Colts actually weren’t horrible on the mound, and Umbricht was one of a number of Houston pitchers with decent numbers. But they were an abysmal offensive club (in 1963 they scored fewer than 3 runs per game with 62 total home runs and a .584 team OPS ). Umbricht earned the win in his final appearance, on September 29, 1963 — a 4-3 win over the Mets at Houston’s Colt Stadium. I’ve sponsored Umbricht’s Baseball-Reference page. NOTE: Reader Douglas (thanks for the note) asks if the stadium pictured here is the Polo Grounds. I’m not a stadium photo sleuth by any stretch, but it does appear to be the Polo Grounds, based on photos I’ve seen of that stadium, as well as other Colts photos from this set (and Mets photos from this set). It looks like many of the Colts had their ’64 Topps picture taken at this park. 1963 was the last season the Mets played there (and the last year baseball was played there at all). Fascinating card! Reminds me that I had a chance to buy a baseball signed by the entire ’63 or ’64 Colt 45’s from a pawnshop about 15 years ago for only about $20. He died exactly 10 years before Aaron broke the homer record. I don’t have many cards left from my childhood but kept this one because of the memorial statement. Is the stadium in the background the Polo grounds? Thanks for sponsoring his page. I’ve added a note about your inquiry at the end of this post. Thanks for the comment. Timothy, it appears that this was a partially signed team ball for the 1962 Milwaukee Braves (now Atlanta Braves) as all 4 players you’ve identified were on the team at the time. Cecil B is most likely Cecil Butler, a relief pitcher who had a cup of coffee with them in 1962 and 1964. Bob Uecker is now in the Hall of Fame (as an announcer and ambassador of the game). He is still alive as of this date. In terms of $$$ value, I doubt the ball would bring that much, however, the Braves also had 4 other Hall of Famers on that club- Hank Aaron, Warren Spahn, Ed Mathews, and (soon to be inducted) Joe Torre (going in as a manager of the late Yankee Dynasty, but an MVP himself in 1971). If those “other” signatures are theirs, then there could be some modest value, especially given that Mathews and Spahn are deceased. However, don’t expect any sale to make a significant improvement in your lifestyle. The cost of authenticating the signatures would likely eat up a significant part of the sale value of the ball. As is the case with a lot of memorabilia like this, the value is more sentimental than anything else- obviously to your grandfather; but perhaps also to you because it is something that your grandfather likely valued that he gave to you. I had a meet and greet with Jim Umbricht and Pete Runnels in 1963 and they each signed my baseball. It’s a special ball for me for the reasons you’ve so nicely stated. I’m pretty sure that is the Polo Grounds. Back then, Topps had a monopoly on the sportscard market and they were based in NY. To save money, they typically would photograph the visiting players even in home unis sometimes when they played at the Yankees or the Mets (or before then, the Dodgers and Giants). My 64 Umbricht card is also a miscut.